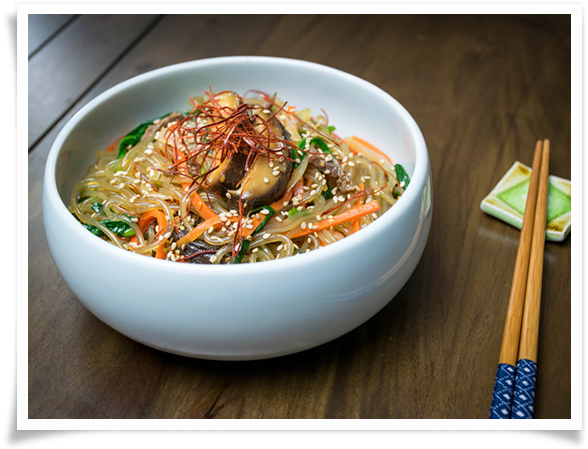 Japchae is probably one of the most popular Korean dishes to Koreans and non-Koreans alike. The sweet potato noodle dish is a staple at parties, birthday celebrations, and any get togethers in Korean households. Although it is loved by all, it is one of the most time consuming dishes because every component is cooked and seasoned separately before it is mixed together. Because it is so time consuming, it is considered dish for special occasions, and it was a real treat when my mom would make it for dinner. In US, you will see it as a banchan at a lot of Korean restaurants. The japchae they serve as free banchan is a very simplified, noodle oriented version, nowhere as good as what Korean people are accustomed to having at home. I've tried to simplify making japchae in different ways without sacrificing what makes japchae so delicious. This post will be the traditional recipe, going over the step by step process in making japchae that I have grown up with. I'll do another post that has a simplifed version, and you can try to make it both ways to see which you prefer! First, make the marinade for beef and mushrooms. Mix 2 teaspoons soy sauce, 1 teaspoon sugar, 1 teaspoon minced garlic, and 1 teaspoon oligosaccharides (oligosaccharides can be replaced by corn syrup or honey, and it's optional if you don't have it). Pour 1/2 of the marinade into the beef and mix well. Set aside. Second, boil a pot of water. Cook mushrooms for about 2 minutes, then rinse in cold water and drain. Cut into slices and pour the other 1/2 of the beef marinade and mix well. Set aside. Third, using the same pot of water to make it easier, blanch spinach for about 30 seconds to 1 minute. Remove from boiling water, rinse under cold water and squeeze excess water. Add 1 teaspoon of soy sauce, 1 teaspoon of sesame oil and 1/2 teaspoon of minced garlic and mix. Set aside. Add a teaspoon of oil into a pan and add onion. Sprinkle salt and sautée for a few minutes. Set aside. Sautée carrots in the same fashion. Sautée for couple of minutes, set aside. Sautée bell pepper in the same fashion. Sautee for a few minutes, set aside. Fifth, cook the meat and mushrooms that have been marinating. Sautée beef for about 5-7 minutes, set aside. Sautée the mushrooms for a few minutes, set aside. Now you need to cook the noodles. It's better if you let the noodles soak in some water for 10-20 minutes, but not necessary. Boil a big pot of water, add 1 tablespoon of soy sauce and 1 tablespoon of vegetable oil and cook the noodles for 6 minutes. Follow the instructions on the package, since cooking time might differ. The soy sauce helps flavor the noodles a little bit, and the oil prevents the noodles from sticking together. While the noodles are cooking, make the marinade for japchae. Combine 2-3 tablespoons of soy sauce, 1 1/2 tablespoon of sugar, 1 tablespoon of oyster sauce, and 2 tablespoons of sesame oil. When the noodles are done, drain, and add the marinade. Mix the mainade into the noodles (be careful, noodles are hot!). If you want to wait until the noodles are a little cooler, then add a little sesame oil into the noodles to prevent them sticking together. Add the marinade once the noodles are easier to handle. Finally, add the beef and all the vegetables and mix together. Taste and adjust the seasoning accordingly. Depending on the brand of soy sauce and the amount of salt that was used in the ingredients, there can be a big difference in the saltiness. Sprinkle sesame seeds and some red pepper threads for garnish, and you are ready to eat! Once you've made japchae, you know that it is really versatile depending on your personal preference. You can omit the meat to make it vegetarian, increase the amount of vegetables to make it healthier, try different vegetables altogether, and add different ingredients such as imitation crab or fishcakes. 1. try not to use too much oil when sautéeing ingredients since it can become too greasy when you mix it all together. 2. Make the marinade for the beef and the marinade for japchae in the beginning to make it easier. 3. You can use the same pot of boiling water for mushrooms, spinach, and noodles, but make sure it's big enough for the noodles. 4. To re-heat, you can do so using the microwave, but the best way is to pan fry it with a little oil. I'm sure all the steps are a bit overwhelming, but this was how they traditionally made japchae. Do you see why it was a dish for special occasions? Just imagine making this and 10 other banchans at the same time, which is what moms usually did in Korean homes... I guess I can't complain too much. Enjoy!